NYPD Commissioner Bill Bratton announced a new police unit that will specifically respond to terrorist threats and protests. NEW YORK CITY — A brand new unit of 350 NYPD officers will roam the city with riot gear and machine guns, trained specifically to respond to terrorist threats and public demonstrations, Police Commissioner Bill Bratton announced. 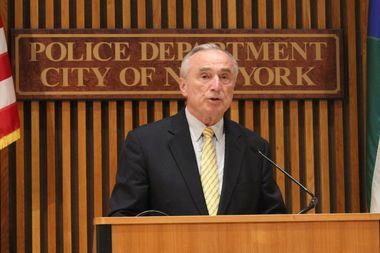 Bratton said that New Yorkers would see the unit emerge over the next six months, and that the department is currently looking for officers who might be up for the challenge. Bratton said the new unit would enable other officers to stay within their beats, and not get called out to respond to citywide emergencies. The commissioner's announcement was immediately met by alarm from groups critical of NYPD police tactics. They said the squad would aggravate police-community relations, not improve them. “[The plan suggests] the opposite of progress,” said Priscilla Gonzalez, from Communities United for Police Reform, an umbrella coalition that is against tactics like stop and frisk and broken windows policing.